Following is a compilation of information on the property known as the Rufty/Wilhelm Mill. The information is from personal recollection, newspaper article, and library research sources including the McCubbins/Linn files, Rowan Heritage book entry, deed books, wills, court records and estate data. With all research involving the 18th and 19th century, data is not complete, but is sufficient to reconstruct a reasonable story. 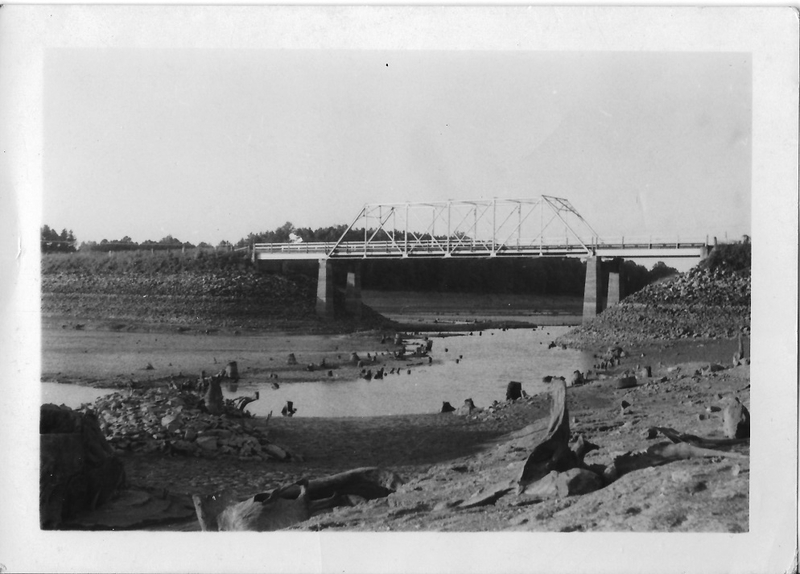 Rufty/Wilhelm mill just before destruction when Power Company flooded the property with High Rock Lake project. Old Rufty/Wilhelm mill course on Dutch 2nd Creek at Bringle Ferry Road. Dutch Second Creek is located in Morgan Township in southeastern Rowan County. 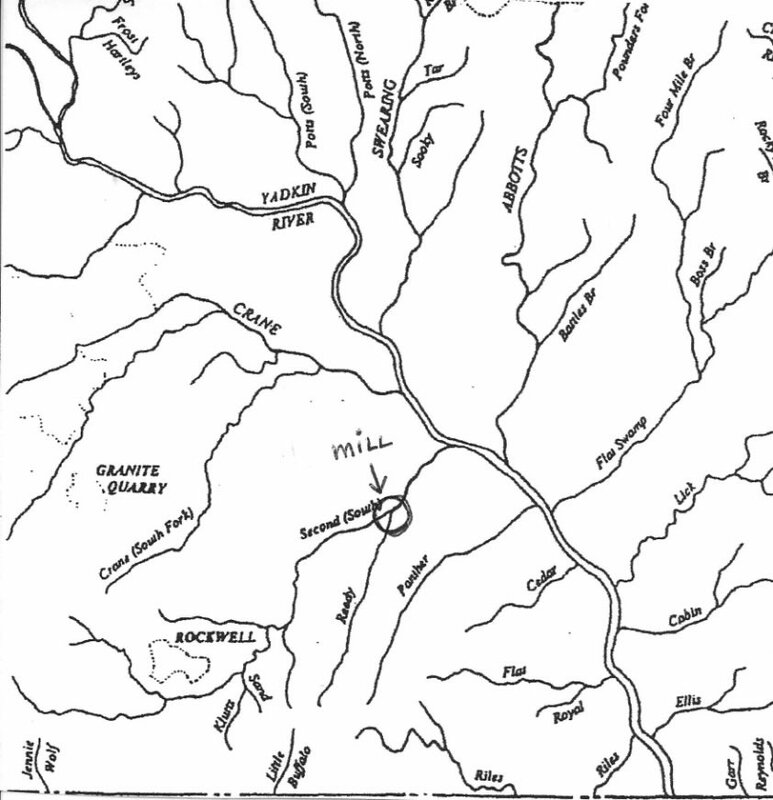 The southern section of the creek originates below the town of Rockwell with several feeder streams and drains north, more or less paralleling Reedy Creek, which lies to the east of 2nd creek. The two creeks intersect into Dutch Second Creek proper which empties into the Yadkin River at the Rowan/ Davidson County line. The Rufty/Wilhelm mill was located at the intersection of Dutch 2nd Creek and Reedy Creek. sides of 2nd and Reedy Creeks and extending far to the west of 2nd Creek. Conrod Bullon who was born circa 1698 in Germany died around 1795.
was the Frederick Fisher acreage. creek site. Krite may also have been related to the Conrod Bullon family. Michael Krite, who died sometime before 1800, operated the mill until 1797 when he sold the mill site and mills with additional adjoining property now totaling 443 acres to George Bullin, Senior, the grandson of Conrod Bullon. George Bullin operated the mills until sometime around 1818. There is no deed of transfer, but the property had passed to Henry and Samuel Wilhelm sometime around their marriages in 1818 and 1823. The brothers, Henry and Samuel Wilhelm owned the mills jointly until the death of Henry in 1829. The property, then included 621 acres from an apparent, but not recorded additional purchase of land to the east of 2nd Creek (possibly property belonging to the estate of Philip Jarrett, a neighbor). The joint property was divided into two tracts, one to the east containing 281 for the heirs of Henry Wilhelm and 93 acres for the widow, and one to the west, including the mills containing 257 acres for Samuel Wilhelm. There was a $750 debt owned from Samuel to the Henry Wilhelm estate to equalize the property division. Samuel Wilhelm died in 1833 and his property was divided 1/3 each to two sons, George Lewis and Samuel and 1/3 as dower to the widow. The mills were rented out by the guardian of the minor sons, Abraham Hill. The operator of the mills is not named in the administrator documents, but Edward Rufty may have been a renter for at least part of this time. Son Samuel died circa 1840 and his interest in the mills was apparently sold to John Hartman which he sold to Peter Hartman in 1845. The proceeds of this sale were probably used to settle all or part of the debt to the heirs of Henry Wilhelm. The dower lands apparently were sold to David Barringer, less 2 acres sold to Edward Rufty prior to 1858 (this 2 acres probably included the Samuel Wilhelm home at the mill site). George Lewis Wilhelm came of age in the early 1850s. In 1853 he sold his 1/3 interest in the mill property to Edward Rufty. The remaining 1/3 interests were sold by Peter Hartman in 1853 and by David Barringer in 1858 to Edward Rufty. This purchase of the full Wilhelm western property of 257 acres with the mills was supplemented with additional adjacent property purchases in the 1850s. 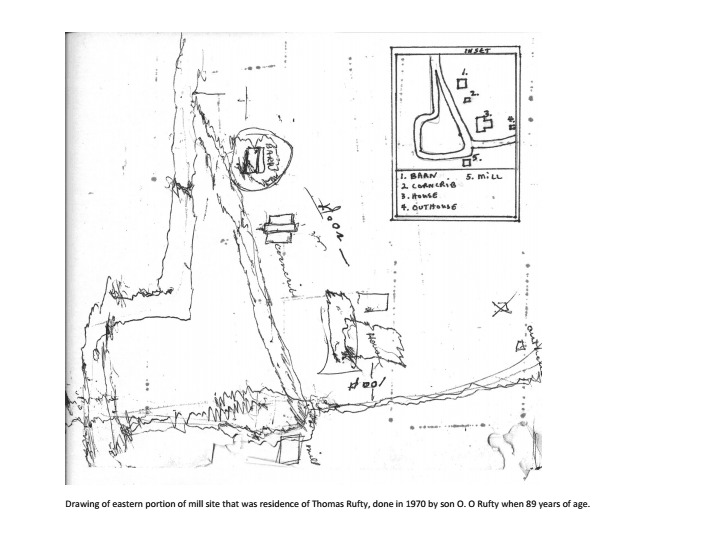 Apparently a portion of the eastern Henry Wilhelm property (belonging to Jessie Wilhelm) was acquired by Edward Rufty because this land was included in Edward's estate. 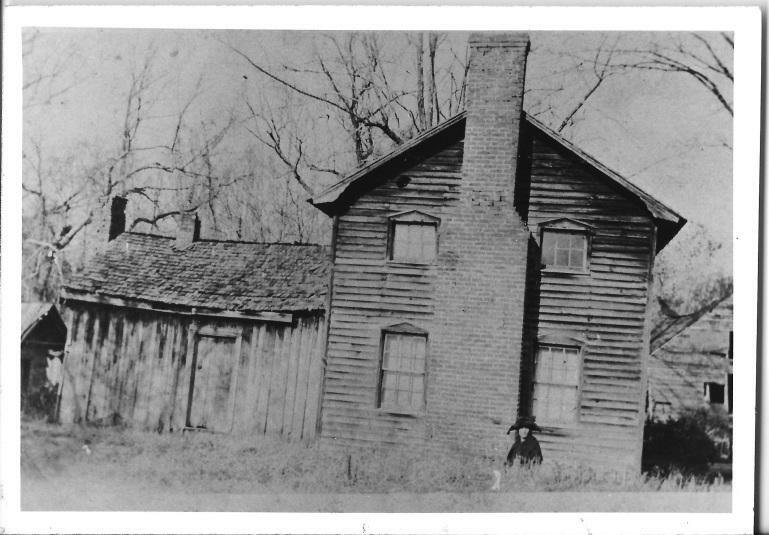 The estate included the grist mill, the saw mill, one house on the western property where Edward Rufty resided (presumably the Samuel Wilhelm house though it was later referred to as "the Annie Carter" place), and two houses on the eastern property (the Henry Wilhelm or older house, which was a log cabin, and a newer house built closer to the mill by Edward's son Thomas Rufty). Edward Rufty operated the mills until his death in 1873. The mill property was divided between his four sons. All sons had a ¼ interest in the proceeds from the mill and corresponding responsibility for the costs of maintaining the mills. The land was divided into an eastern portion given to his two older sons James Rufus and Thomas Rufty, and a western portion given to his younger sons, Milton C. and John Rufty. Son Thomas operated the mills. Thomas Rufty operated the mills until his death in 1902. The Thomas Rufty site went thru one more division when the joint property of Thomas and James Rufus was divided in 1902. The last of the property was sold to Lorenza Carter just before the Tallassee Power Company acquired the property and flooded it with High Rock Lake. The mill site is now under water. 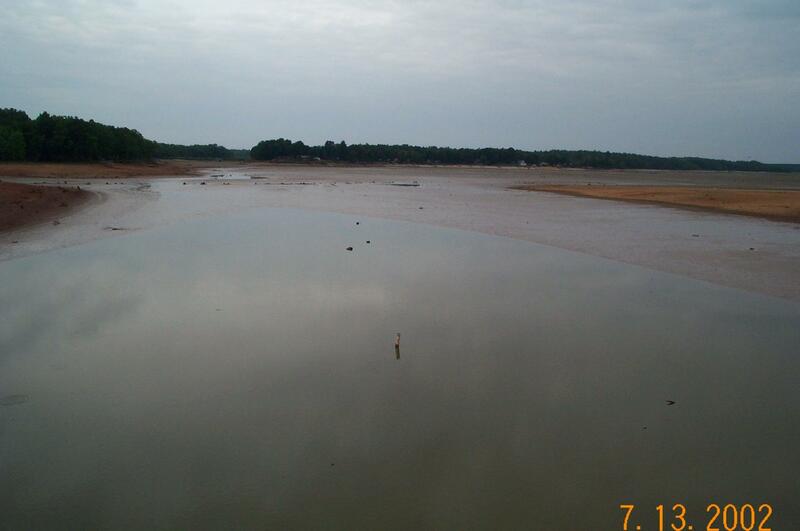 Supposedly the old mill stone can be seen at low water as part of the foundation stone on the lake dam. For interesting details on mill construction and operation see introductory section of Vol 1 of History of Grist Mills in N.C. by Stewart E. Dunaway. "The earliest record found on the mills is a survey and commissioner's report stating that Samuel Wilhelm was to pay the heirs of his brother Henry Wilhelm, the sum of $750 for his interest in the grist and sawmill. This was dated March 23, 1829. On Feb. 7, 1833, Samuel Wilhelm, deceased, willed the mills to his wife, Dorothy, and George L. Wilhelm. On March 28, 1853, George L. Wilhelm deeded a 1/3 interest in the mills to Edward Rufty and 257 acres of land. In the same year, Peter Hartman deeded his 1/3 interest to Edward Rufty, and on Oct. 15, 1858, David Barringer deeded the last 1/3 interest to Edward Rufty. 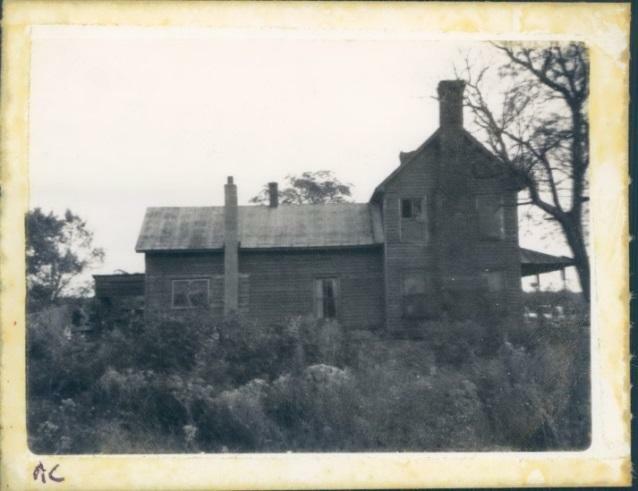 Edward, in his will made Feb. 28, 1878, deeded the property to his children James R., Thomas, Milton C. and John Rufty, including both mills and 16 ½ acres of land. Thomas operated the mills until his death in 1902. According to the Ruftys, the mills ceased to operate after the death of Thomas Rufty. The property was sold to Lorenza Carter just before the Tallassee Power Co., acquired the property and flooded it with High Rock Lake." In 1852 Edward Rufty bought the Wilhelm farm and mill and land across the creek later known as the Anny Carter place where he lived. His son Thomas, after marrying, moved across the creek to the Wilhelm home. Later he built a one room building closer to the mill. There Oliver Oscho Rufty was born in 1881. In 1890 Thomas built on the kitchen. The house had no front porch, but a back porch. It was two-story with a hall running down the middle. Its roof was wood shingles. The Wilhelm mill that was sold to Edward Rufty was not built by Wilhelm. It was possibly built some 100 or more years before. The back of the mill faced the creek, the front toward the Rufty house. The front had one door in the center with a large window above it and a smaller window over. They had no glass but had shutters. There were two windows on each floor on the sides, no windows in the back. In the front on the left hand side was a large chimney which came from a huge fireplace inside. The top two floors of the mill were used to store grain. On the floor there was a drop off (two feet) and then another drop off (5-6 feet). There were two stones; one for wheat (flour) and one for corn (meal). They were both turned by the same turbine (6 feet). The turbine was moved by water of the creek (15 feet wide) supplied by a race that ran from the back of the house to a pond formed by a dam. This rock dam (300 feet long, 15 feet tall at the highest point) built at the same time as the mill was probably built by slaves. There was an old bridge and road 100 feet off the new road (the Bringle Ferry Road). The saw mill was opposite the grist mill. O. O. Rufty left the countryside and moved to the city of Salisbury where he became a merchant. The doctor had told him that the mists rising from the river were dangerous to his health. The mill quit operation in 1902 when Thomas Rufty died. In the 1920s both the mill and the houses were torn down by the company building the new dam. Additional: George Long owned and operated a large store at Trading Ford. He decided he would like to establish a branch at the Rufty mill. A store was built and Catherine Bringle Rufty (O. O. Rufty's mother) was engaged to manage and operate the branch ($6.25 per month salary). given by OO Rufty in 1970. Property description: On both sides of 2nd Creek at Reedy Creek, adjoining Michael Crite, Phillip Jarret, Killon Aaronhart & others. Conrod was in Rowan County as early as 1752 as a taxable, so he may have been on the property earlier than the date of the deed. No document proves he built the mill, but the property location is an obvious site for its operation. OO Rufty recollected that the mill was 100 years old when purchased by Edward Rufty in the early 1850s. Conrod's son George probably worked on the mill site property – he is shown as a part of Conrods entry on the 1768 tax listing. On 8/7/1781 the court ordered "that Conrod Bullon be now and hereafter exempt from paying any tax" (possibly because Conrod was the advanced age of 83 in 1781). The map below from Rowan Library Collection of old plot grants from 1700s is helpful in interpreting deed/land transactions. 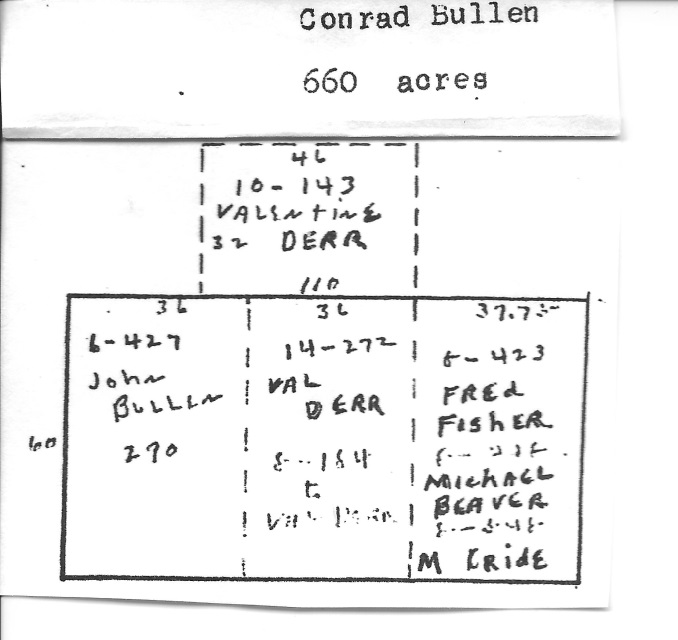 4/14/1767 Deed from Conrod Bullin & wife Mary to son John Bullin 220 Acres (1/3 of 660 acre plot) for 50 lb proc. from Waldman on 4/24/1778 to Frederick Fisher (noted as part of old Bullen property). 2/10/1774 Deed from Conrod Bullin & wife Mary to Valentine Derr (Tarr) 220 Acres (1/3 of 660 acre plot) for 124 lb proc. it to Brougher (117 ½ acres) and Fisher (252 ½ acres); Jacob Brougher sold his 117 acres on 9/6/1805 to Leonard Crosser. This property eventually made its way to John Eller in 1812. 5/28/1777 Deed from Conrod Bullin & wife Mary to (Captain) Frederick Fisher 220 Acres (1/3 of 660 acre plot) for 250 lb proc. Fisher owned in his lifetime, which was extensive, only the deed of sale for this property was signed by a wife. for 650 pounds. This larger sales price than the purchase four months later also indicates the property was an inheritance not a regular land transaction. Beaver then sold the property on 4/26/1778 to Michael Krite. 4/26/1778 Deed from Michael Beaver & wife Marey to Michael Krite (/Cride/Creight) 220 acres (1/3 of original 660 acre plot) for 650 lb. Property description: on both sides of 2nd Creek adjoining Valintine Dirr. 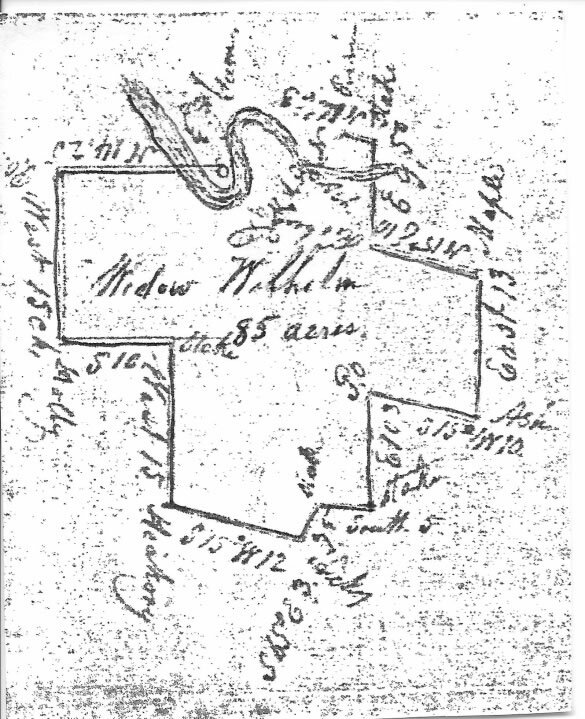 Michael Kright, who first appeared on the Rowan tax listings in 1759, was granted 75 acres from the state on 11/4/1784 on the north side of 2nd Creek, adjoining his own land, Phillip Garratt (/Jarrett), Killian Averhart, Valentine Darr. This property became the northern part of the mill site property. mill property shown in the subsequent sale of the mill, so perhaps it's source is part of the vacant land described in 1778. (220 acres plus 75 acres plus 148 acres generally agree with the total 459 acres shown on the 1784 tax list for Krite). joined to the mill site property. As noted in the subsequent sale of the property to George Bullen, the mills existed under Michael Krite's ownership. 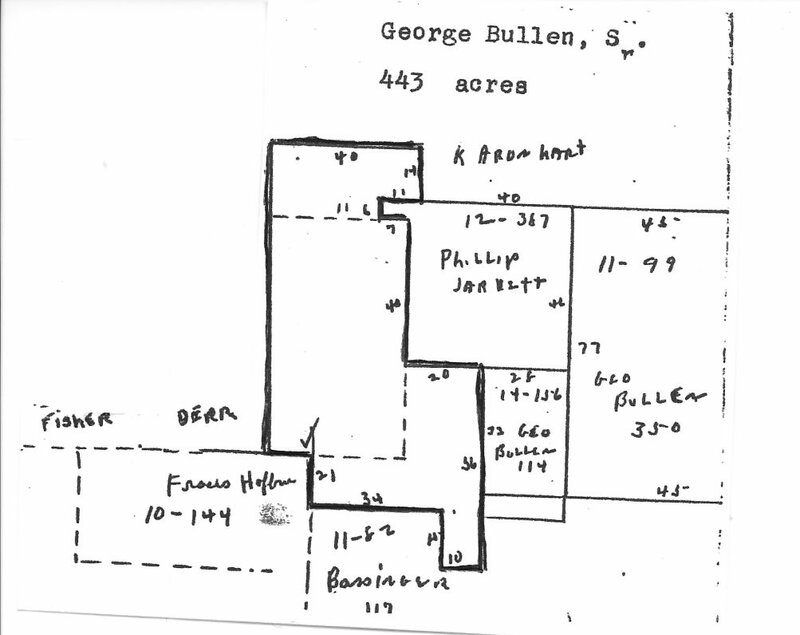 George Bullin is son of John Bullen who died in 1795 and the grandson of Conrod Bullon, the original property owner. Michael Krite had died by 1800 at which time Krite's orphans (George, Valentine, Catharine, Susanna) were assigned to guardians Frederick Fisher, George Fisher (his son) with Jacob Brougher as security. This seems to indicate a family link between Krite & the Conrad Bullon family. in 1809 by George Fisher, the son of Frederick to Robert C. Haden. overflow from his millpond onto the subject 134 acres. (This property was the southern section of the 443 acres). The mill property had now been reduced to 236 acres. a 1786 state grant for 350 acres next to the 114 acres and Phillip Jarret who had property adjacent to the eastern section of the mill property. the property was described as adjoining Bullon, Jarret, Sheerman, Frock and Frick. Haden later moved to Alabama and at some date between 1808 and 1818 sold the property to Henry Culp who then sold the property on 8/1/1818 to Abraham Hill (who would later be guardian to the orphans of Samuel Wilhelm). The property was described in 1818 as adjoining George Trees, Conrad Bullin, Sherrman, Frock, Fraley, Sanderson & Frick and being on the Wilhelm line. Jarret is not mentioned. This seems to mean than Henry Wilhelm, who married in March, 1818, had purchased all or part of the 329 acre Philip Jarrett tract which appears to have later become part of the Wilhelm mill tract. There is no record of the purchase or other disposition of the Jarret land in the records. The 1820 Census shows a "widow Jarrett" which reinforces the speculation. property in the 1820s. There is no record of George Bullen Senior after 1818, so he may have died during this time. 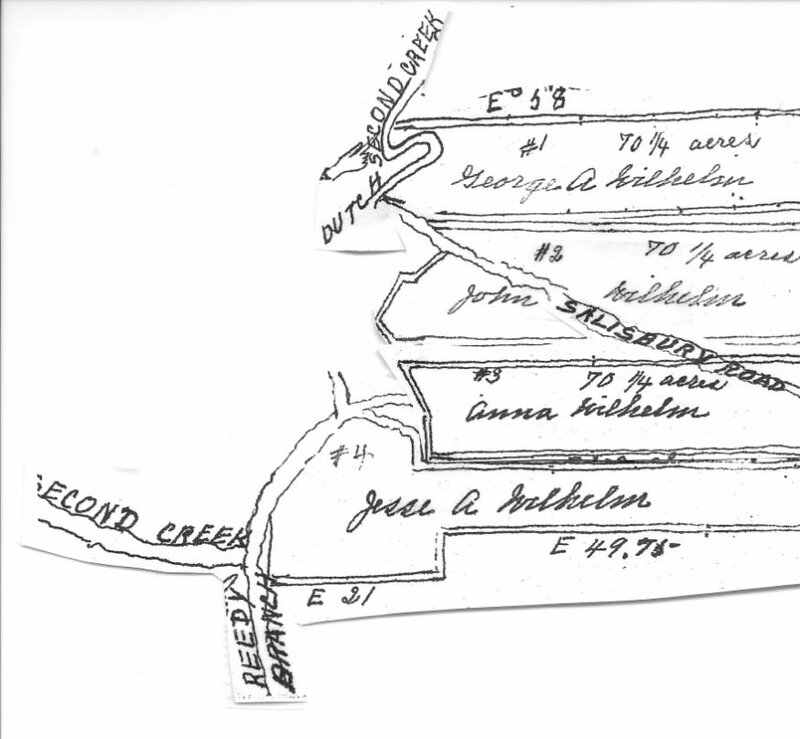 On 5/21/1825 John Earnhardt deeded an unspecified number of acres to Henry Wilhelm on both sides of 2nd creek which was his undivided interest in the estate of John Earnhardt (the Henry Wilhelm estate division may indicate that this is the 93 acres allotted to the widow, Margaret Earnhart Wilhelm as her dower right). The Wilhelms operated the mills until Samuel's death in 1833. Henry Wilhelm died around 1828. The joint property owned by Henry and Samuel Wilhelm was divided on 3/23/1829. The total acreage was 538 which could be guessed to be made up of 236 or so acres from the George Bullin Senior mill property plus part of the adjoining Philip Jarret property of 329 acres and or some other unidentified acreage. Samuel received 257 acres on 2nd Creek adjoining Beaver and Coldiron (who had purchased part of the old Conrod Bullon plot in 1810). This was the property to the west of 2nd creek, including the mills. As compensation for the value of the mills, Samuel was to pay the heirs of Henry Wilhelm, deceased $750 in three payments. 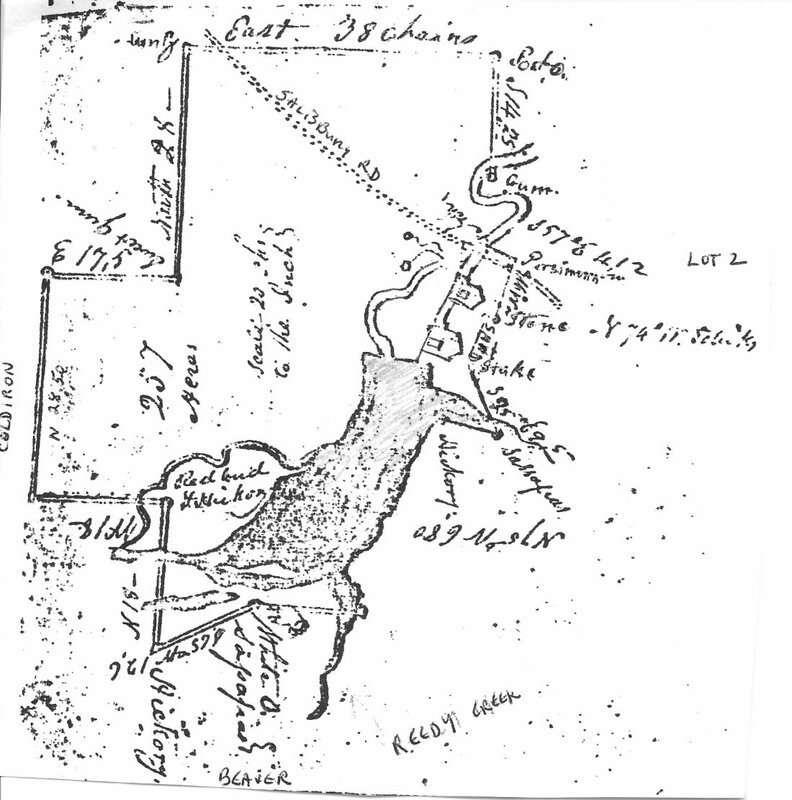 Henry Wilhelm's estate received 281 acres of the east side of 2nd Creek. Henry who died in 1828 left a widow Margaret "Peggy" and four minor children – Jesse, John, George A., & Anna. 8/23/1825 (probably mistranscribed and should be 1828 or 9) Peter Cauble was assigned as administrator of the intestate's estate and Jacob File was assigned as guardian to the children. The widow received a dower interest of 93 acres on 4/19/1831. This may have been the Earnhart tract from 1825. Margaret remarried on 4/5/1831 to Samuel Stoner, a neighbor. Son George A. was a newborn or nearborn at the death so the division of the children's interest was not completed until 6/28/1850. Each child received 70 ¼ acres , which totals 281 acres from the division of Samuel and Henry's joint property. The land was rented during their minority. Lot # 1 to George A. Wilhelm, on 2nd Creek next Widow Misenheimer, the great road, near the bridge. Lot #2 to John Wilhelm, near the sawmill, dividing line, Widow Misenheimer, lots 1 2. Lot #3 to Anna Wilhelm, next to Nicholas Bringle, Widow Misenheimer crossing the road. George A. Wilhelm is shown with wife Sarah Goodman on the 1850 Rowan Census, age of 21 (b. 1825). Around 1859 he moved to Johnson Co., Illinois and is shown in the 1860 Census age 39 with wife & 5 children. He died 9/4/1864. John married Catherine Peeler 2/18/1846. He died in 1851 leaving 2 infants, George L. and John H. (who is buried at St Matthews). His land passed at public sale to Thomas Bassinger. Anna Wilhem never married. Her tombstone at St Matthews shows a birth date of 1821 and death date of 10/15/1868. Jesse A. Wilhelm is noted in 1851 estate papers of brother John. He appeared in the 1850 Census, age 25 (born 1825) in the household of John Shepherd. He is shown as removed from the St Matthews rolls in 1853 so he may have moved though he has not been located on an 1860 Census. 257 acres adjoined George Kesler, the heirs of Henry Wilhelm on 2nd Creek including a saw and grist mill. In February, 1834 Abraham Hill was appointed guardian of the sons, George Lewis and Samuel. Samuel died between 1841 and 1845 (his death expenses were a $17.65 charge to the estate) and his interest in the property likely was purchased by John Hartman which on 12/6/1845 was sold to Peter Hartman. The mills were rented out until son George L. Wilhelm was of age in January, 1850. There are various administrator reports over the years. In 1835 a bolting cloth was purchased for the mill at a cost of $36.00. The mother's dower for the year was $24.00. In 1836 there were repairs costing $25.00 made to the mill and dam. 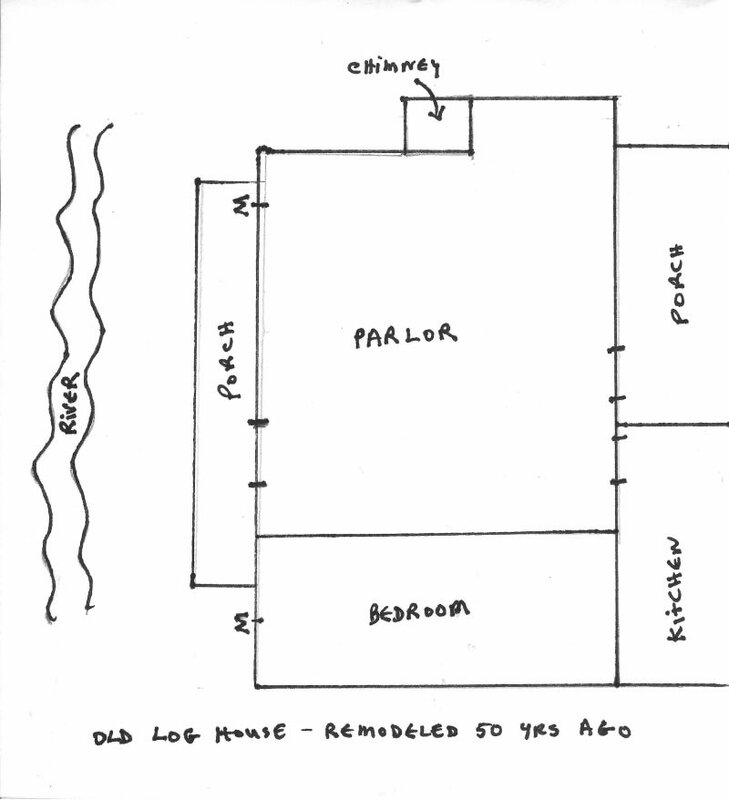 These repairs were from damages for which the estate received a reimbursement of $45.60. Also in this year leather for "mak ellewaiter" was purchased for $1.50. Rents over the years 1833 through 1850 averaged around $50 per year if both the mill and land were rented. In 1842 - 1847 it seems only the land was rented for $20. The name of the renter of the mill is not known. In the 1850 Census for the area Edward Rufty, age 43 (future purchaser of the mill) is listed as a millwright. The same is true for a John Baim, age 25 listed in the same census district as the mile site. During these years the mill was occasionally used by the congregation of St. Matthews Lutheran Church for services. In February, 1836 intestate lands were laid off. Widow Dorothy Wilhelm received 1/3 part of the proceeds of the saw & grist mills annually and 1/3 of the rent of the mills for the year 1835 by paying 1/3 part of the expenses or cost of a bolting cloth and new saw purchased that year. The dower was 85 acres of land at the bridge on the creek bank. Dorothy Wilhelm remarried Ben J. Eller on 3/14/1837. At some point between 1836 and 1845, David Barringer likely purchased the Wilhelm dower of 85 acres. 3/28/1853 George Lewis Wilhelm sold to Edward Rufty for $830 a 1/3 part of all lands and mills known as the Wilhelm Mill Tract on 2nd creek adjoining Henry Wilhelm's corner, Coldiron, crossing the Salisbury Road containing 257 acres. On 4/12/1853 Peter Hartman sold his 1/3 interest in the same property to Edward for $900. This tract may have been the Samuel Junior tract sold to John Hartman. (Peter Hartman had written a will on 2/3/1852 leaving his wife Sally three tracts of land including the Wilhelm Mill Tract. The will provided that the widow could sell the property with the consent of George L. Wilhelm if the heirs were unwilling to have the mill repaired). On 10/15/1858 David Barringer sold his 1/3 interest in the same property to Edward Rufty for $1400. 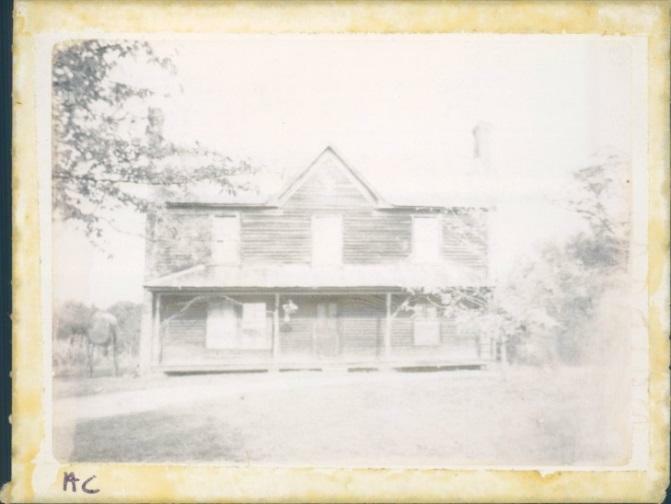 The property was described as tract and mills on 2nd Creek, crossing the Salisbury Road, to the mouth of Reedy Creek branch, 257 acres including the saw and grist mills, except for the 2 acres which was sold to Edward Rufty before. This may have been the dower tract and the previous 2 acre sale contained the Samuel Wilhelm home. If it was the Wilhelm home, then Edward may have occupied it prior to the 1853-58 purchase of the tract and he may have been the renter operating the mills during part of the minority of George Lewis. In the 1850 Rowan Census, Edward Rufty, age 43 is listed as a "millwright". He was not known to be a miller prior to his 1853 purchase, however his wife Elizabeth Brown Rufty was the granddaughter of Abraham Brown who operated a mill, as did her brother after Abraham's death. Edward Rufty sold George Lewis 150 acres on 2nd creek that had come from the estate of Joseph Smith at the day after he purchased the mill property. George married Catherine Hartman on 8/21/1850 and had three sons, William Harter, Samuel Luther and John Thomas baptized at St Matthews before his eventual move to Johnson County, Illinois between 1857 and 1860. He had several relatives there, including cousin George A. Wilhelm. At some point in this period of time, Jessie A. Wilhelm sold his ¼ portion of the Henry Wilhelm estate, 80 ½ acres on the east side of the mills, to Edward Rufty. This is known because of the subsequent inclusion in Edward Rufty's estate. 3/24/1856 Nicholas Bringle and wife Dorothy sold Edward Rufty 23 acres on 2nd Creek next the pond, ____Wilhelm, big road and ___ Poole. 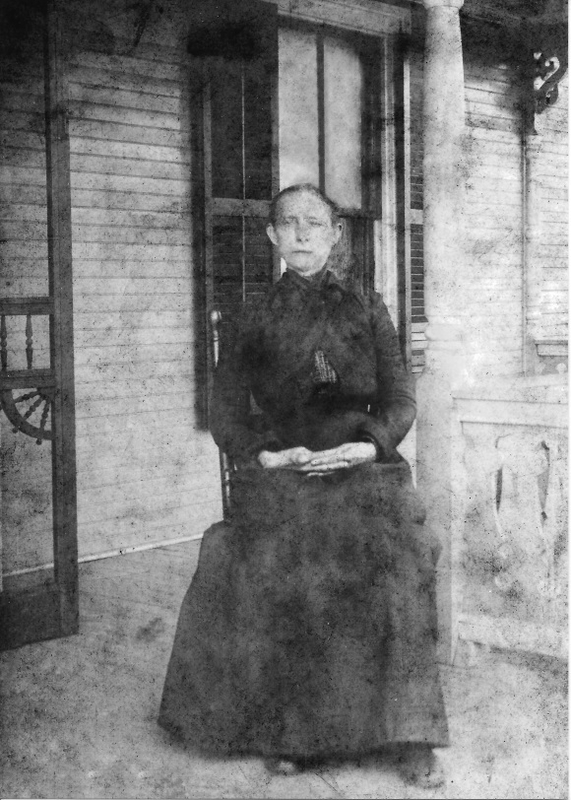 In two unrecorded deeds (in possession of the Rufty family) on 11/4/1857 Elizabeth Stoner, widow of Samuel Stoner sold Edward Rufty for $290 (as dower right) 39 ½ acres on 2nd Creek adjoining the lands of Anny Wilhelm, David Misenheimer, widow Misenheimer and Edward Rufty; on 9/19/1857 William M. Lefler & wife Chrissy sold Edward Rufty for $55 105 acres on 2nd creek belonging to the estate of Samuel Stoner and another tract on the west side of 2nd Creek adjoining Edward Rufty, David Misenheimer, Anna Wilhelm, Charles Stoner, George Fricks, Moses Kesler and others, being an undivided interest in the above named tracts which descended as heirs at law of Samuel Stoner. 90 ½ acres of these lands were sold by Edward to Silas Wiatt on 2/17/1860 leaving a remainder of about 54 acres. (Note: the widow of Henry Wilhelm who had a dower of 93 acres, had remarried to a Stoner). There were other purchases and sales of properties over the ensuing years. The basic mill tract stayed intact. Edward Rufty operated the mills until his death in 1878. 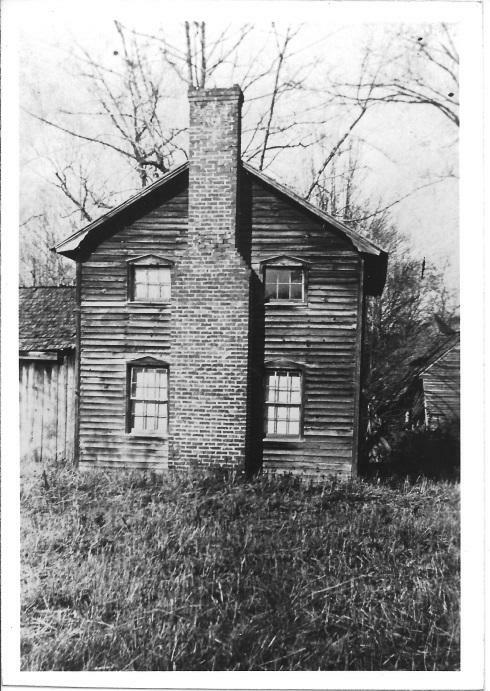 Edward Rufty home on the west side of the mill site later known as the "Annie Carter Place" after sale of the property to the Lorenzo Carter family. Thomas Rufty home on the east side of the mill site. 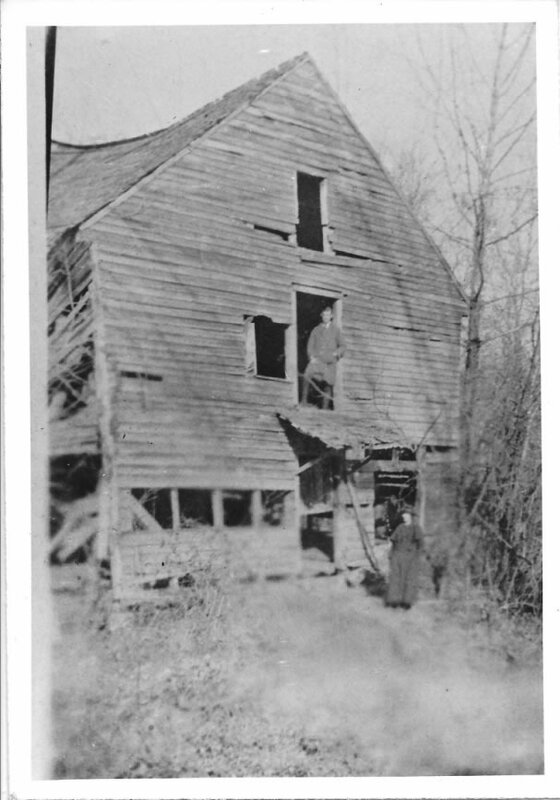 "I give and devise to my four sons, jointly, James R. Rufty, Thomas Rufty, Milton C. Rufty and John Rufty my grist mill and saw mill with all my mill property of every description with all the lands covered by the waters of the mill dam together with a small tract of land lying on the northwest side of my home tract whereon I now live, known as a lot cut off of the John Eller tract containing 16 ½ acres....The said...(sons)...shall share and share alike equally in all the profits and income derived from said mills so long as each one shall pay his proportional part of the necessary expenses that may incur in keeping the said mills and mill dam up. But in case any one or more of them should refuse or fail to pay his or their part of the necessary expenses in repairing and keeping up the aforesaid mills and dam, he or they shall in no case receive any of the tolls or income of said mills until he or they shall pay his or their part of the expenses incurred." "I give and devise to my two eldest sons James R. Rufty and Thomas Rufty jointly all that tract of land whereon the said Thomas Rufty now lives lying on the southeast side of Dutch Second Creek to them and their heirs. But in case three of my sons should sell their interest in the mills and mill property devised to them ...my executors shall expose to public sale to the highest bidder the said tract of land devised to the said James R. Rufty and Thomas Rufty and the proceeds arising from the said sale of land shall be equally divided among my four sons and three daughters equally share and share alike." "I give and devise to my two youngest sons jointly Milton C. Rufty and John Rufty all my tract of land whereon I now live, the mill, mill property and mill pond all excepted to have and to hold to them and their heirs... 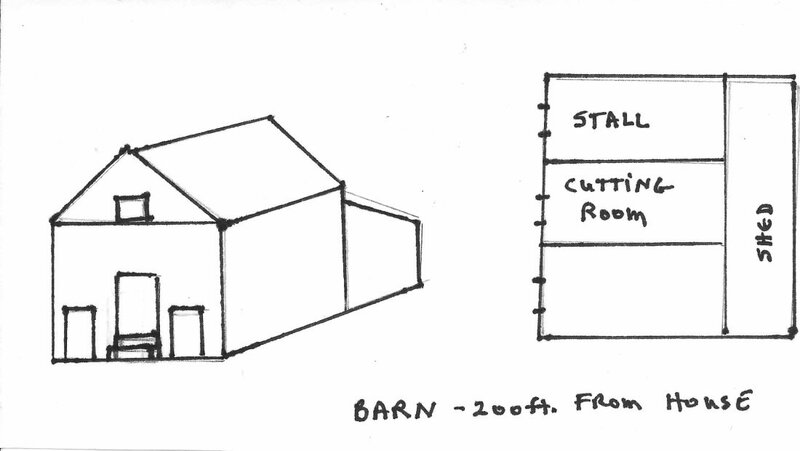 It is further my wish and desire that my youngest son John Rufty shall have the dwelling house and buildings on the said premises so long as he holds his interest in the said premises and it is my wish and desire further that he shall put a new roof upon my barn after my death if needed." Edward further left to his daughters $400 each from the sale of personal property and "one small tract of land known as the Kesler tract". He left to Amanda Nash as trustee for her young sons William and Sydney Nash "for attending upon me in cases of sickness" "a tract of land, known as my File tract lying on the southeast side of Dutch Second Creek containing fifty six acres of land." (Note: this looks like the Stoner estate tract). (As an additional note, Amanda Nash's sons, age 3 and 1 are designated as "Nash". As adults they used the names William Franklin Rufty and Sydney Charles Rufty. They are presumed to be the children of Edward Rufty, born to Amanda Nash after the death of Edward's wife Elizabeth in 1873). 8/8/1904 Two tracts of approximately 2 acres were deeded by James Rufus Rufty and Milton C. Rufty to St. Matthews Lutheran church. The remainer of the property passed to Lorenzo Carter who sold the property to the Power company. Son Thomas Rufty operated the mills until his death in 1902 (he is shown as a "miller" in the 1900 Rowan Census) and then the mill ceased operation. His wife, Catherine Bringle Rufty also managed a small store owned by George Long on the mill site for many years. 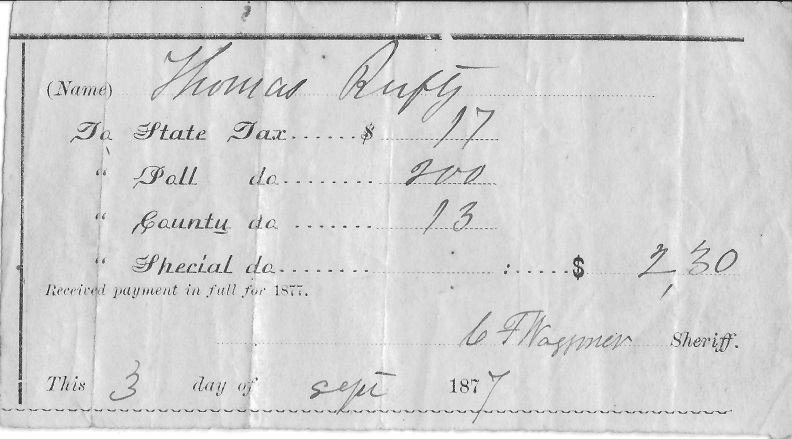 Thomas Rufty died 10/26/1902. On 6/1/1903 the joint land of Thomas and brother James Rufus Rufty were divided. This is the last piece of mill site land owned by an operator of the mill. Subject to Catherine Rufty's right of dower, the heirs of Thomas Rufty were assigned Lot #1, property on 2nd Creek adjoining W. L. Ludwig, Mrs Stoner containing 45 acres. 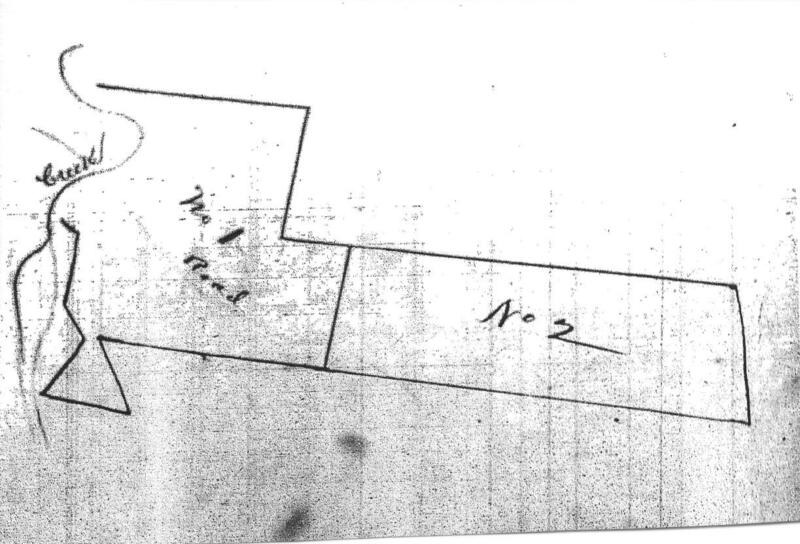 James Rufty Rufty was assigned Lot #2 adjoining Lot #1, adjoining W. A. Hoffman containing 41 ¾ acres excepting about 2 acres more or less heretoford sold to St Matthews Church, and another lot adjoining Joe Poole and Lawson Poole at Reedy Branch containing 16 acres. The 45 plus 41 acres, totaling 86 acres, corresponds to the portion of the Henry Wilhelm estate given to Jesse A. Wilhelm. 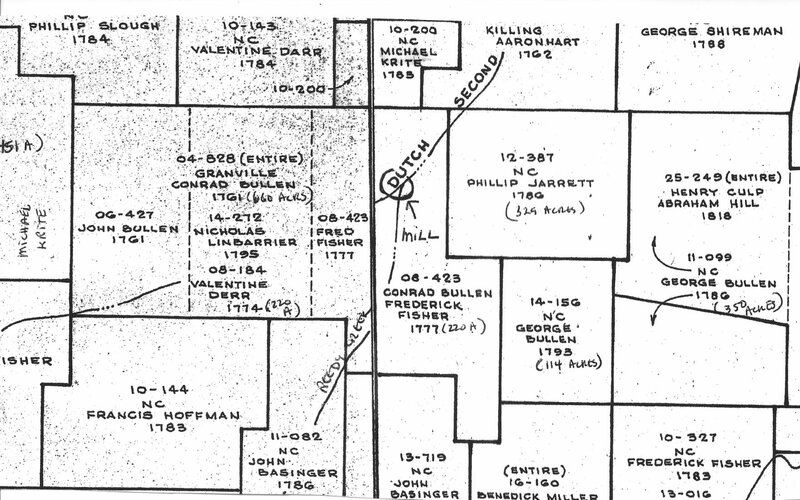 The 16 acres corresponds to the "Eller tract" noted in Edward Rufty's will. Thomas and Catherine Bringle Rufty, the last operators of the Rufty/Wilhelm mill. Strange fact: On July 2, 1904 O. O. Rufty, son of Thomas Rufty, the last operator of the Rufty/Wilhelm mill, married Mary Lizer Lemly, the fifth great granddaughter of Conrod Bullon, the first owner of the mill property and probably the first operator. If I could see you now, I should like to talk about the Old Home Place. Your memories of it go back farther than mine, but mine are very pleasant memories. The very earliest is of having a tobacco poultice applied to my forehead by Granny Stoner, after I had been stung by a bee. But most of my memories are of the winter and spring of 1909 and 1910. Hardly anybody now can remember what a one-room schoolhouse was like. And only a teacher can appreciate what a task Mr. Tom Morgan had in organizing lessons and recitations for children from six to sixteen years old and keeping order, sometimes by corporal punishment, although he had only one arm. There was just one small blackboard, up beside his desk. A pot-bellied stove in the center of the room was lighted in the morning by big boys who came early. They also filled the bucket of drinking water, with its tin dipper which sat on a bench in the cloakroom. The little porch served as a stage at commencement time, which was then called "the Exhibition". I suppose that was because we exhibited by songs and recitations what we had learned. And I learned at least as much in that one-room schoolhouse as in any other school, though I attended it less than three months. I still remember all the verses of "The Sea" and other poems we memorized. I learned the multiplication table there, and the names of all the presidents, and the states and their capitals. That was the first year I studied US History. Indian Territory was not yet a state, and a revolution was going on in Mexico. I walked two miles to school, with the Carter children. Mary Lou was my age and was my most frequent playmate. We cracked black walnuts on the stones under a walnut tree in front of her house, staining our fingers dark brown; we played chopsticks on their little organ, and we ate snits and hutsels in the attic. There was a persimmon tree in the middle of a field and locusts that we enjoyed on the way home too. That winter I wore rubber boots, knee-high. The thick red mud sucked at the boots with every step uphill, and I slithered from side to side on the way down. The boots were quire heavy for jumping rope at recess. The "rope" was a muscadine or scuppernong vine, and they sometimes hung from trees in such a way as to provide swings. One day I got a ride home from school, standing on the back of a buggy in which Essie was riding with her fiancé. I remember her dark hair curling in ringlets against her neck and her rosy cheeks. 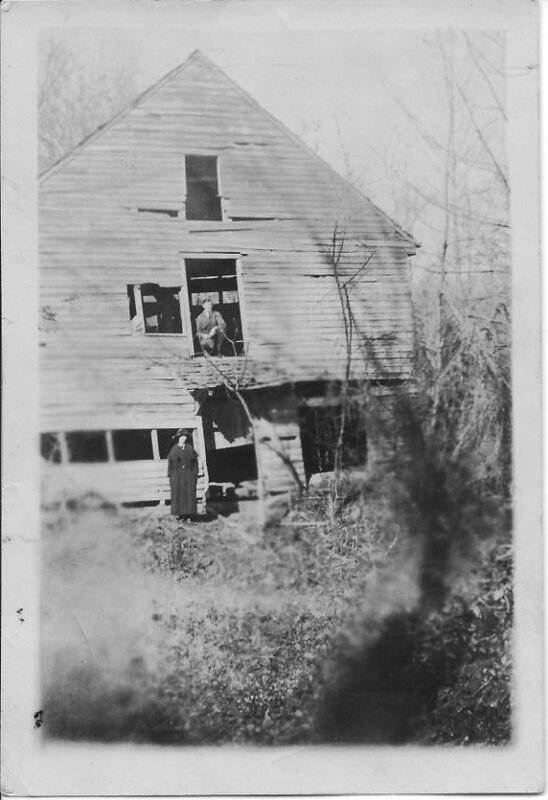 There was a brief snow that winter, and Uncle Ed gave me a shutter from one of the mill windows to slide downhill on. A little hump of earth stopped the sled just before it could cross the road into the creek. We all went together to pick out a Christmas tree from the edge of the woods, Grandma, Mama, Uncle Ed, Catherine (as we called Kitty then), and I. Besides the regular ornaments and the bright little angels and other figures that Grandpa Blair had made, we strung popcorn and cranberries. And after the holidays were over, we hung the strands of popcorn from the corncrib ridgepole and watched the hens jump up to get it. Part of the time we had milk from Grandma's red cow, and occasionally I tried my hand at churning, out on the piazza. But at other times, I went to Carter's for milk and to Laborus Ludwig's for butter. They had a circular churn, I remember, and a stamp to mark a design on the butter. I also remember sitting by the kitchen fireplace while Grandma showed me how to card cotton and get rid of the seed. And I watched her making little cakes flavored with kimmel seed, cutting the rolled-out dough with a wheel that left scalloped edges. My tenth birthday I spent with Ruth Van Poole. I remember that it was my birthday because her brother Tom surprised me with a birthday present, a blue vase that he bought over at Eller's store. I remember being shown the skeleton in the doctor's office and playing in the carriage house and cutting out paper dolls. And instead of saying our prayers at our bedside, we said them downstairs at the doctor's knee. Of course, I looked through the bookcases and I borrowed "Uncle Tom's Cabin". Everybody knows of it, but I never met anybody else who has actually read it. That winter I found some reading material in Grandma's attic, too. There was a book recounting the atrocities of the Spanish-American War. But the most interesting thing was Sir Walter Scott's "The Black Dwarf", which had run as a serial in the "Charlotte Observer". I think that was the first novel of Scott's I ever read. But I also began the ambitious project of reading through the Bible, inspired by Grandma Rufty's repeated readings. I didn't get very far, but at least I made a good start and got a foundation for later study. With the spring came new discoveries. During a walk on the other side of the creek, I saw a black racer, and I was told about Grandpa Rufty's pet black snake and how it was run over by mistake. We made fishing poles of cane and I caught one small fish, but felt sorry for it and threw it back in the water. I learned that you could lean over from a batteau and catch a water bug that had a spicy fragrance like the sweet bubbie or Carolina allspice. And bright cushions of moss, of every shade from the palest to the deepest green, appeared along the creek's edge and the roadside. We made little playhouses of sticks and stones and bits of moss for upholstered furniture. There was a revival meeting at St. Matthew's and that started us children to playing church. I was the preacher, whether we played at Carter's or at Grandma's. And Uncle Ed surprised and delighted us by building a "church", a framework behind the kitchen, with a doorway, a pulpit , and benches. He was always very kind. He put up a swing for me on the apple tree that was between the house and the barn. I like to twist the swing as tight as it would go and then whirl around, watching a blur of peach blossoms in the orchard beyond. Up where the first house had been built, where Mamma was born, the fields were still bordered with daffodils and grape hyacinths (jonquils and blue bottles, they were called then). Aunt Dora later sent me some of the daffodil bulbs and I was given more from Ringwood Minor, and I bought a few dozen grape hyacinths to plant here and remind me those early days. In the chimney corner there were little blue mallows, like tiny hollyhocks, and by the piazza there was a big kerria bush (whose name I did not learn till later). It was covered with pom-poms of bright yellow bloom and I planted that here at Cupsaw, too, and later added a single variety. I must not forget the merry-go-round we had up in the mill, some of us riding and some turning the wheel from below. And when a new house was built on the hill on the other side of the creek, the Carter children and I walked the joists and gathered the wood shavings to hang them under our hats for golden curls. And how good the freshly cut wood smelled. I saw, for the first time, cotton fields in bloom, all ping and white, like the larger mallows in the salt marshes along the Jersey shore. And in the field opposite the new house, pink and white amaryllis suddenly popped up all over, ahead of their leaves. The only thing that disappointed me all that spring was seeing a lamb that turned out to be a dirty gray, when all the pictures showed lambs as snow-white. But, of course, there has to be one fly in the ointment. There are lots of other happy memories...I had no idea how many until I began to write them down for you. 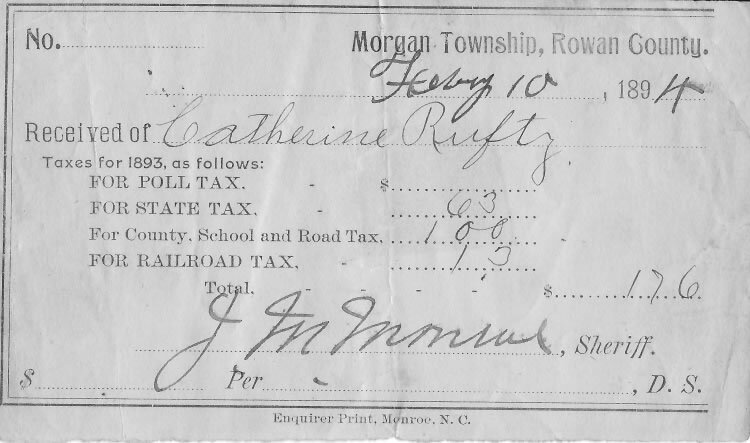 Mary was visiting the Thomas (1851-1902) & Catherine Bringle Rufty (1849-1933) home at the "Rufty/Wilhelm Mill" site on Bringle's Ferry Road, in Morgan Township, Rowan County. The mill still existed but was no longer operational. "Mary Blair"– Mary Blair Marshall (b. 1900), daughter of Ada Rufty Blair (1876-1966), granddaughter of Thomas & Catherine Rufty. "Carter children/Mary Lou" – children of Lorenzo and Annie Carter, (in 1910 Census) Mary Lou 10, Alice 8, Jessie 5, lived on Bringle Ferry Road. Lorenzo was the final owner of the (non operational) mill property. The house, where Edward Rufty lived, had as its final name, "The Annie Carter Place". 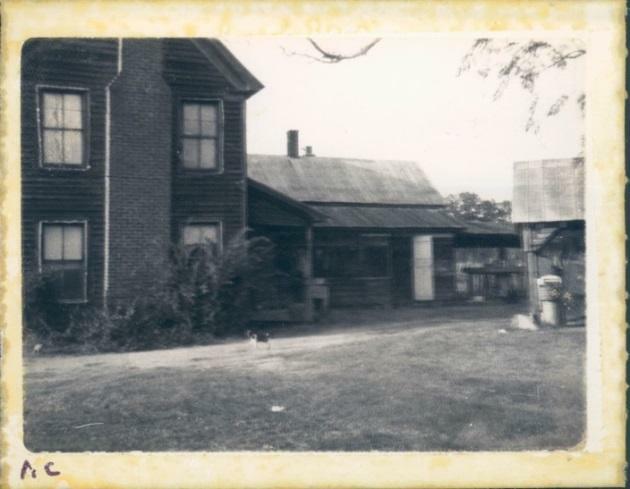 Ruth Van Poole/brother Tom/doctor's office – Chalmers Van Poole was the community physician. In 1910 census, his daughter Ruth was 8 and brother Tom was 14. A U.S. Air pilot flew around the lake taking photos. 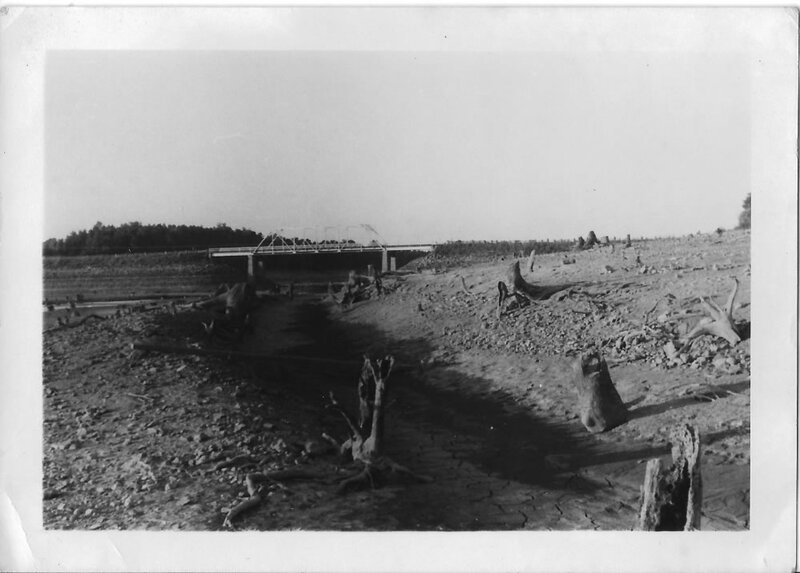 Below is picture taken on Bringle Ferry Road Bridge looking toward the former site of the mill.